Nominative determinism strikes again. Here's the debut trailer and poster for Ti West's western. 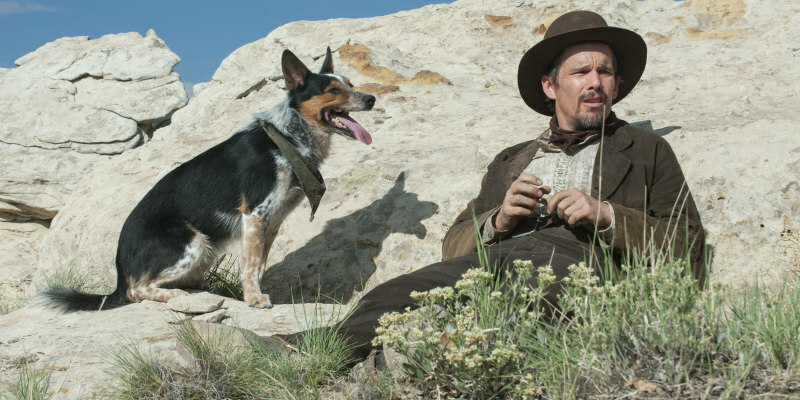 A mysterious drifter named Paul (Ethan Hawke) and his dog Abbie (Jumpy) make their way towards Mexico through the barren desert of the old west. In an attempt to shorten their journey they cut through the center of a large valley - landing themselves in the forgotten town of Denton - a place now dubbed by locals as a "valley of violence." The once popular mining town is nearly abandoned, and controlled by a brash group of misfits and nitwits - chief among them, the seemingly untouchable, Gilly (James Ransone) who is the troublemaking son of the town’s unforgiving Marshal (John Travolta). As tensions rise between Paul and Gilly, Denton’s remaining residents bear witness to an inevitable act of violence that starts a disastrous chain reaction, infecting the petty lives of all involved and quickly drags the whole town into the bloody crosshairs of revenge. Mary-Anne (Taissa Farmiga) and Ellen (Karen Gillan), two bickering sisters who run the town’s only hotel, try to find the good in both men, while desperately searching for their own salvation. Only the world-weary Marshal struggles to stop the violent hysteria, but after a gruesome discovery about Paul’s past…there is no stopping the escalation. 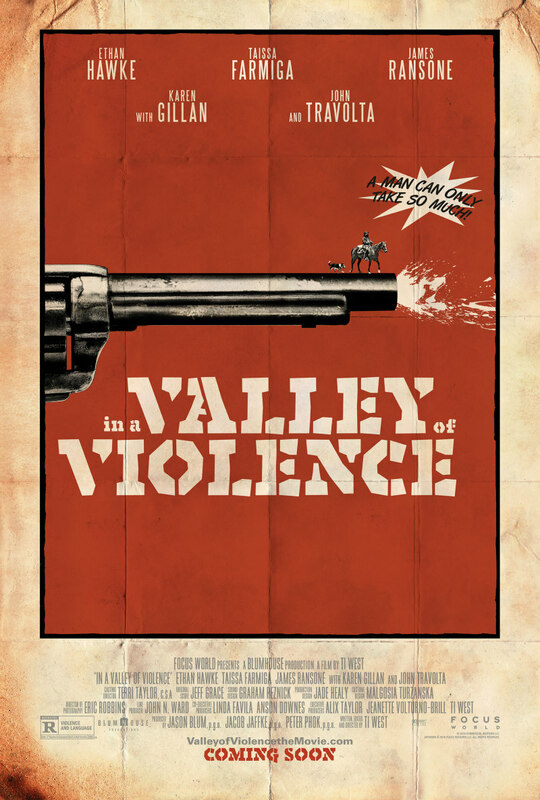 From writer/director Ti West (The House of the Devil, The Innkeepers and The Sacrament), In a Valley of Violence brings absurdist humor, unique dialogue and West’s shocking scenes of violence to the Western genre.